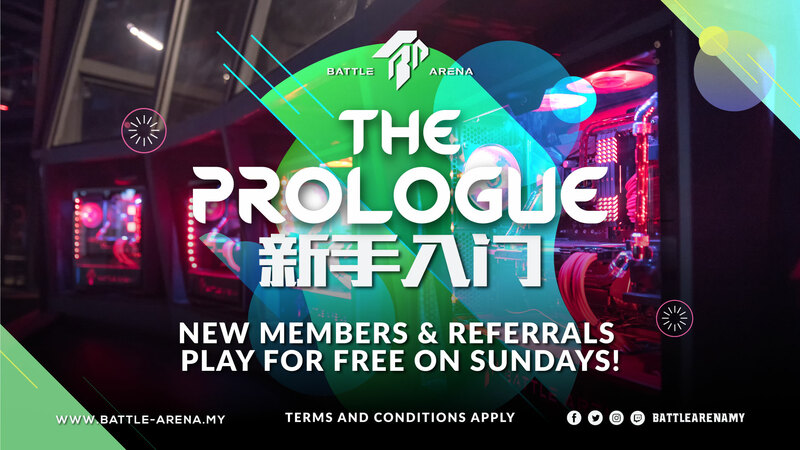 As a new year dawns, Battle Arena’s all new promo “The Prologue” takes flight every Sunday! It’s been almost a year since Battle Arena opened its doors to the public and we’ve come a long way since then. We couldn’t have done it without you! To show our deepest appreciation to our members new and old, we’ve made this Sunday promotion tailored to you guys! Have you ever wanted to play games without having to worry about the internet connection, loading games with the speed of molasses, or even having glitchy peripheral gears? Well, worry not, Battle Arena offers the best gaming experience! From our high spec PCs to our fast and stable internet, gaming will never feel so smooth. All you got to do is register as our standard member with a minimum top up of RM10. With that, you’re already entitled to play 5 hours for FREE on your first session. Aside from that, have you ever asked yourself, what’s gaming like without your friends? Sad, isn’t it? Nothing beats the thrilling feeling of fighting for your next victory whilst enjoying the amazing company of your dear friends. And what better way to do that than having all of them gather altogether in one place! With a simple step, you and your friends can battle it out side by side in your favorite games and play till your heart’s content. Bring your gang over and refer them to sign up for our membership and they’ll be able to play for 5 hours for FREE! Even you are entitled to an extra 5 hours to game for free. However, if you refer more than one friend, it would not stack your hours. Sundays have never been so rewarding! What are you waiting for? Grab your friends, brothers or sisters and head on over to Battle Arena and carry each other to victory!